Includes a red satin style corset with an off-white centre panel and black edging to give the corset more of an impact. It also has black spaghetti straps and fastens up at the back with lace. 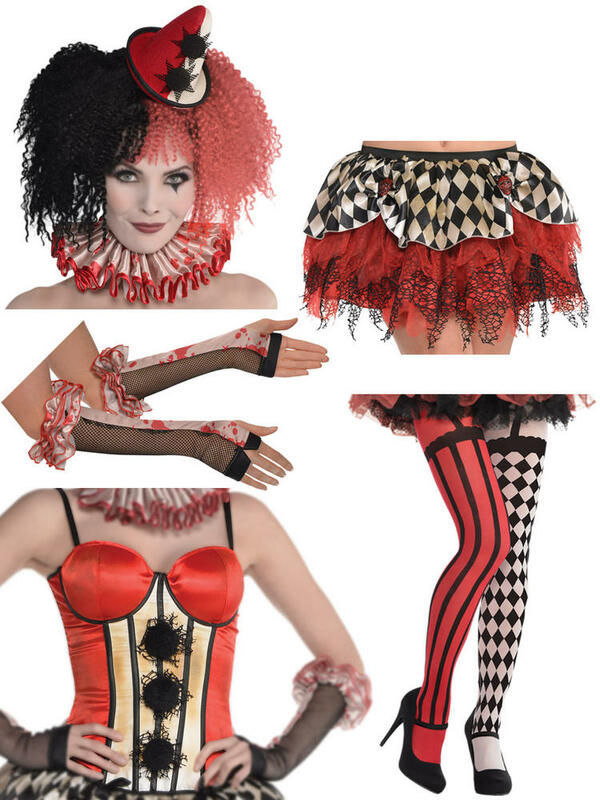 Includes a pair of gloves; the bottom half is made from black fish net material and the top half is an off-white satin style material with a blood spattered effect. The gloves also have pretty ruffles to finish them off. Includes an off-white and black chequered skirt with a red net underskirt with black detailing. Available in a Standard Size (10 - 14) - however please be aware this is approximate and therefore should be used as a guide. Includes a pair of tights with a different design on each leg. One leg is red with black stripes and the other is white with a black chequered pattern. Available in a Standard Size (10 - 14) - however please be aware this is approximate and therefore should be used as a guide. Includes a headband with an attached small red and white hat with a black trim. Includes an off-white sating style ruffle collar with red polka dots and trim.